Summer’s practically over before it’s begun, it seems, and salad days are a little dubious. However, early this year I was making the effort to use the season to eat more healthily, and so I thought it’d be nice to try for a healthier coleslaw to go with my salads. I was overwhelmed with choice! 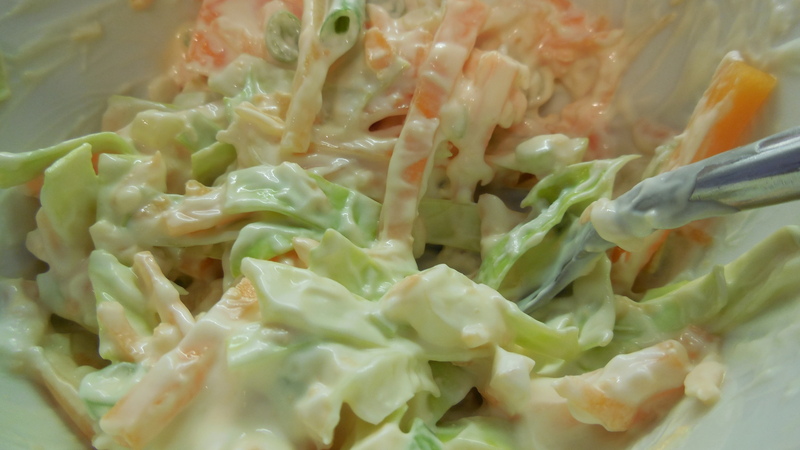 I remember an apple coleslaw from my childhood: should I try making that? Or one of the numerous variations suggestion… Nope, first go, let’s try for classic: carrot, (spring) onion, and cabbage, as shown in my recipe. The ‘healthier’ part was using Greek yogurt (I like the Fage 0% fat one, for all sorts of things) to replace at least part of the mayonnaise. In the end it didn’t really taste lighter – it was almost sickly rich, to be honest! I added another recipe’s suggestion of cider vinegar – just a splash – to try and cut it. I think I need to experiment a whole lot more with this one, to get the right mix. And try adding some sweetness – grated apple, perhaps. Posted on August 17, 2015 by calypte	• This entry was posted in Uncategorized and tagged cabbage, carrot, greek yogurt, mayonnaise, spring onion. Bookmark the permalink. A ha! The guy loves coleslaw. Let’s give this a go.